A Victorian Style Double Ended Sofa having been recently fully rebuilt and re-upholstered,with sprung base and solid polished mahogany frame. 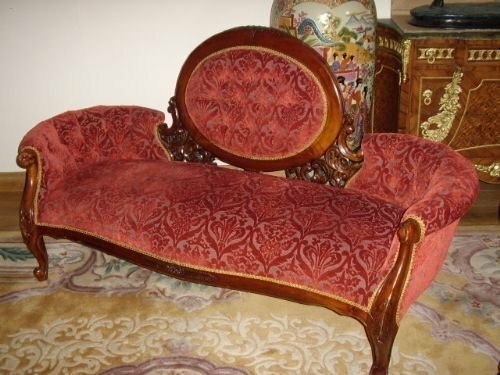 DEPTH 2 ft 6 Inches Approx. 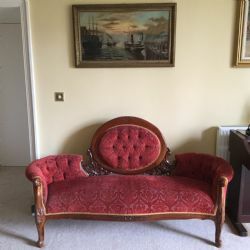 The material is an hard wearing Dralon,chaised in relief with a raised profiled pattern.A sold and comfortable usable sofa ,which would suit a bedroom or drawing room.This piece of furniture looks much better when viewing in person. 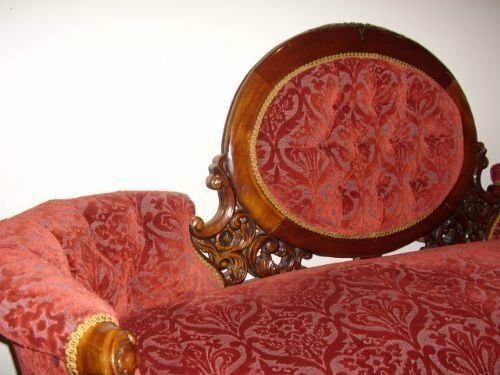 Perfect Never sat on since Re-Upholstery.The back is also fully covered in matching material behind the central backrest. A fabulous heavily carved gilt games table with green marble mounted escaloped top. 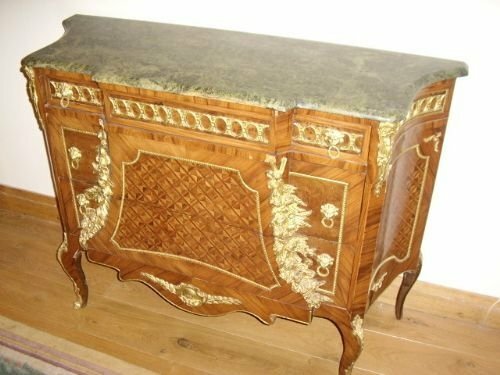 The wooden cabriolet legs are beautifully gilded and heavily carved with elaborate decoration as is the adjoining side rails. This occasional centre or side table is tall enough to allow four chairs to be tucked underneath for ease of storage. 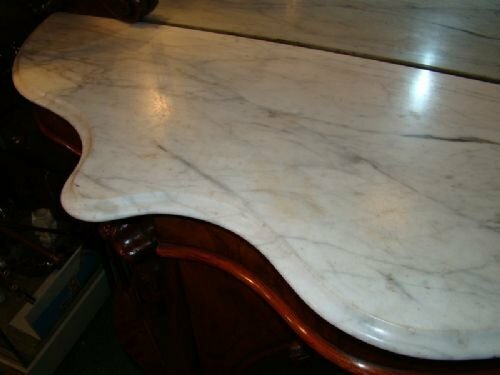 The highly polished marble top has a fine blend of veins running through the heavy top,which is over 1/2 Inch thick and extremely solid. 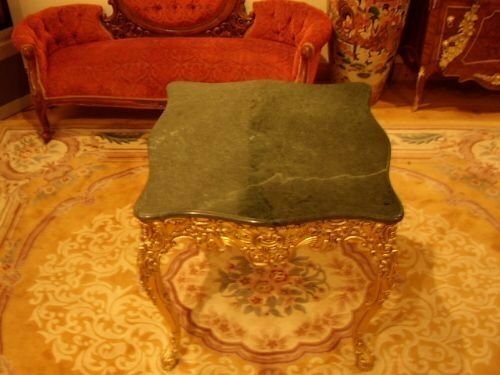 The edge of the marble is ribbed. The overall condition is perfect and obviously an accomplished example of fine craftsmanship. 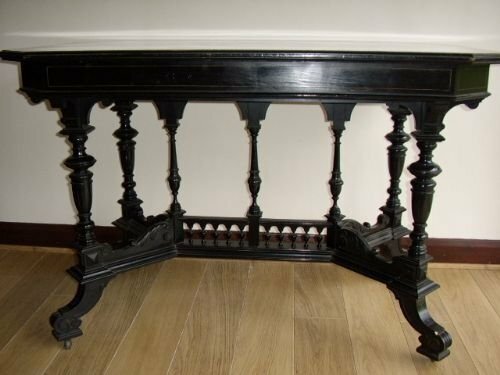 A unique ebonised carved oak 3 tier buffet.The construction of all the joints are cross pinned with oak dowels. 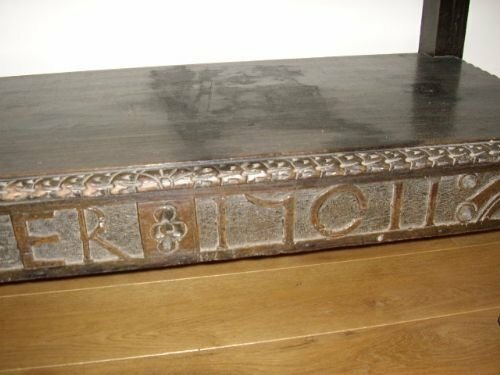 The carved decoration might be flemish as the buffet has an early date carved into the bottom rail reading E R 17 O 11, reference to the date and queen. 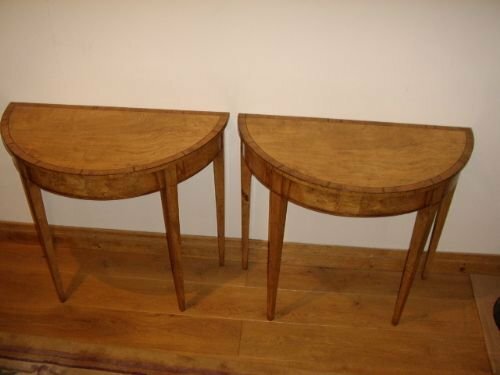 The castors have been added later. 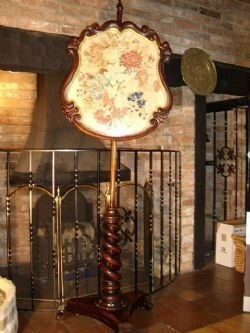 A substantial piece which would suit a manor house or look well in an hotel reception for displaying brosures ,magazines or flowers. 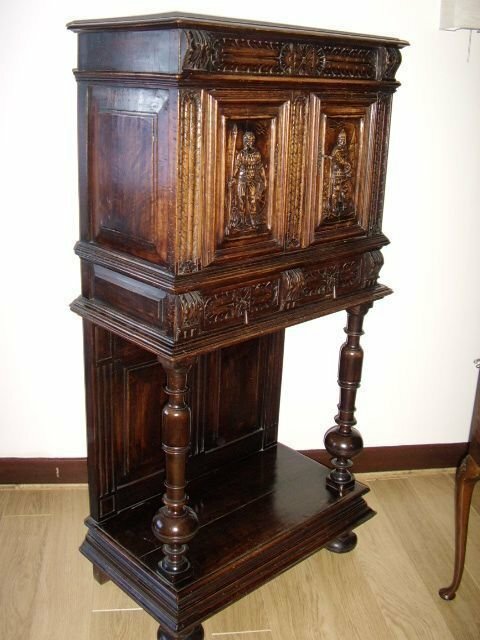 The condition is good with just a slight opening of a natural joint between two planks on the top tier,otherwise the other levels are fine and the top looks acceptable for apiece of thid age. 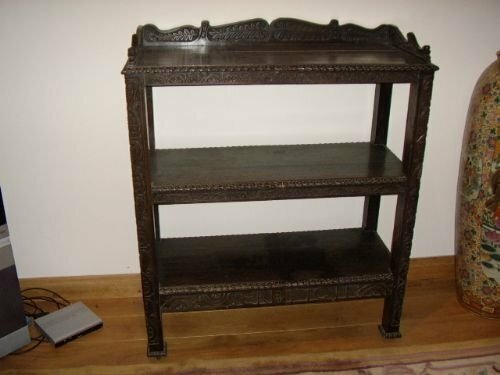 The distance between the shelves being 14 Inches. 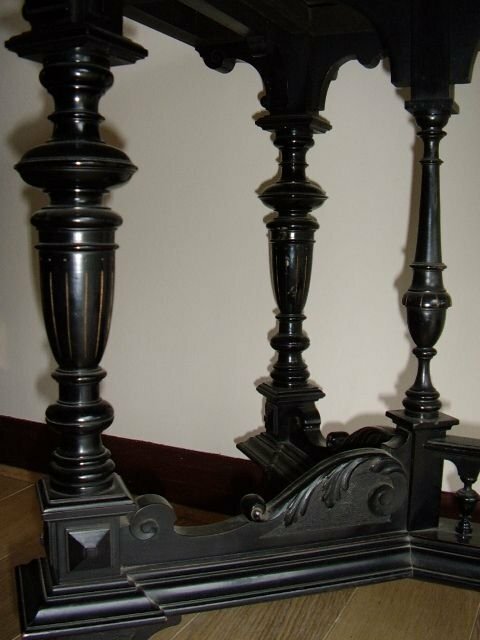 Delivery Charges can be more accurately quoted by providing you post code.All charges will be at trade prices and with insurance. 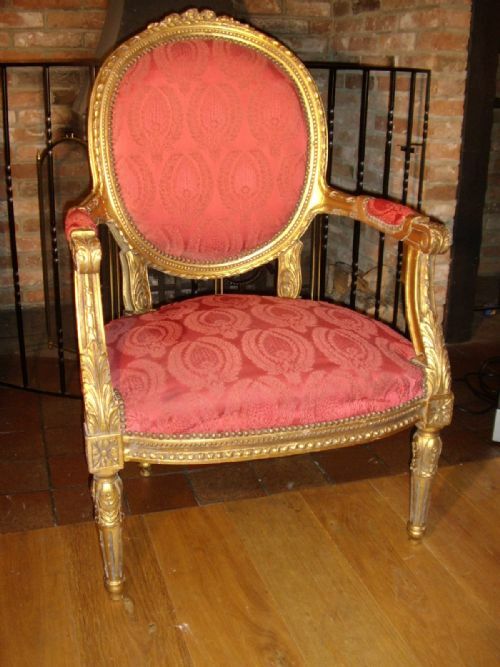 This item will be fully rewaxed prior to a sale taking place to show it at its best. HOURS 10 AM 10 PM 7 DAYS A WEEK. 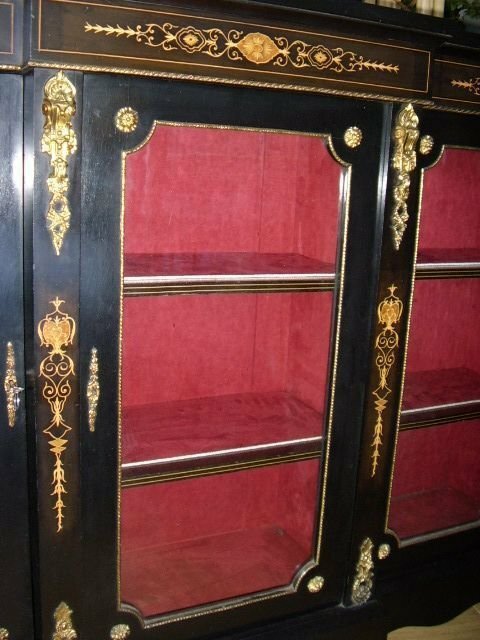 Very good indeed with little or no real usage inside .evident.The cabinet is lockable and has the original key. 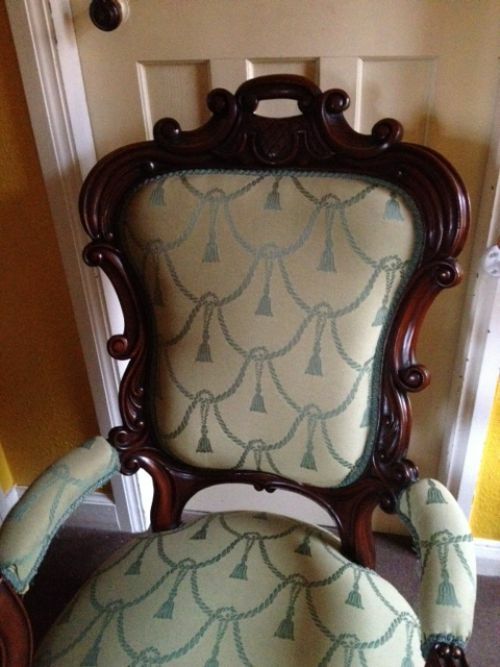 A beautifully shaped Edwardian style Salon Chair with padded arms,suitable for a lounge,hall or bedroom location. 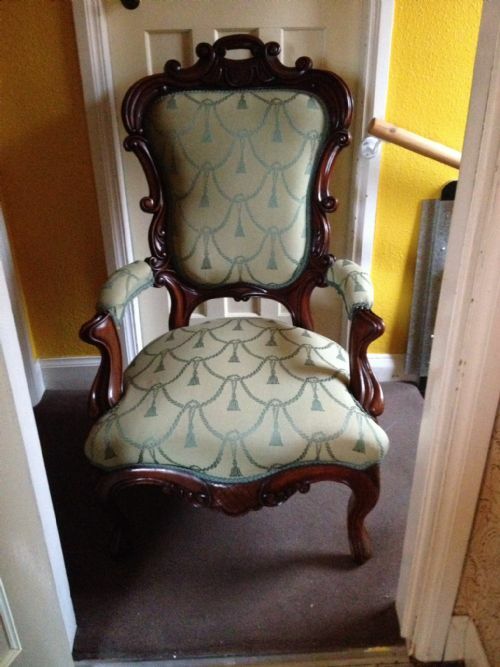 Very clean and tidy and not soiled, hardly sat on since refurbishment. Delivery Uk Mainland Add £75 (7-10 Days) by Man & Van to your door. 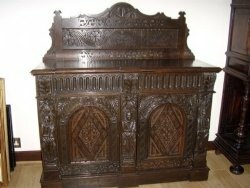 A splendid Period Oak Livery Cupboard dating from the 18th Century. 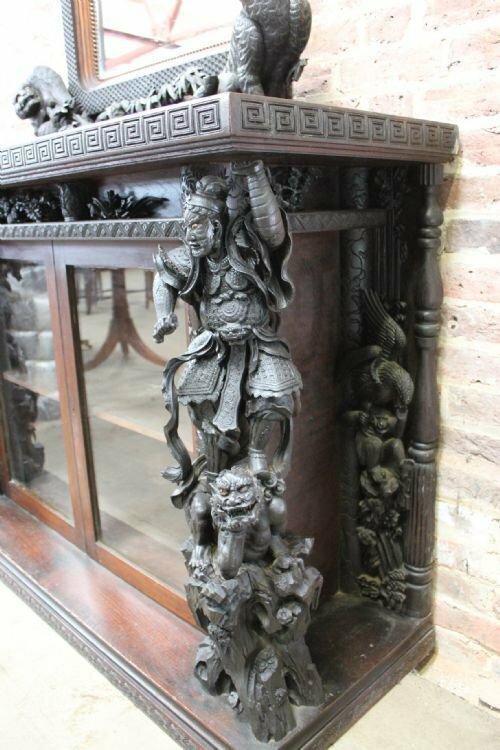 The upper part of this superbly carved piece has two doors enclosing a shelved cupboard, this stands on a pot board base supported by turned and carved pillars and it stands on chunky bun feet. 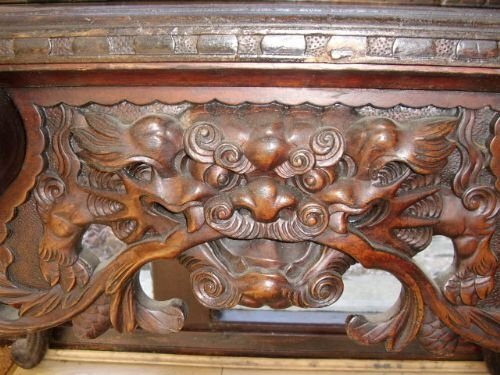 The cornice is elaborately and the door panels are carved with stylised flora and leaves and there is further decoration around the pot board base. 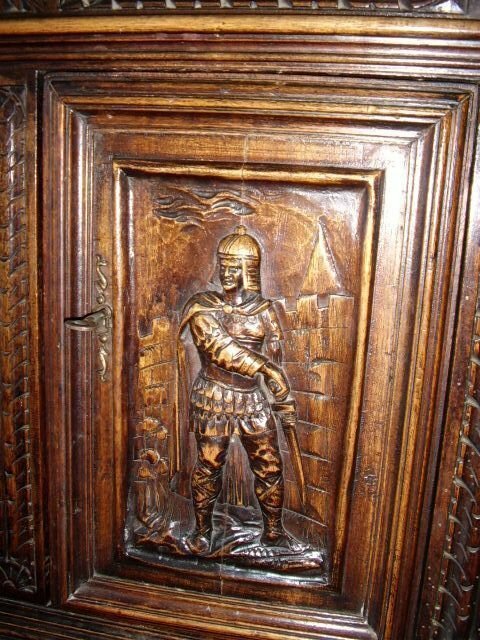 A fine carved oak cabinet on stand depicting a pair of soldiers in armour preparing for battle,supported by a pair of lower turned column supports. 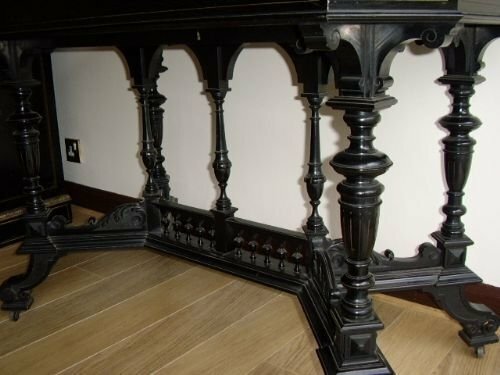 A heavy planked bottom panel infilled with back panelling all being nicely waxed and with good patina. There is excellent detail throughout with deep carved panels in relief.A pair of opening doors to the front,reveals a central fixed centre support. 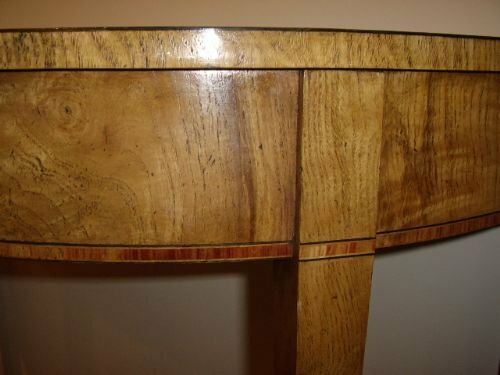 Finished to top and bottom edges with bevalled architraving. 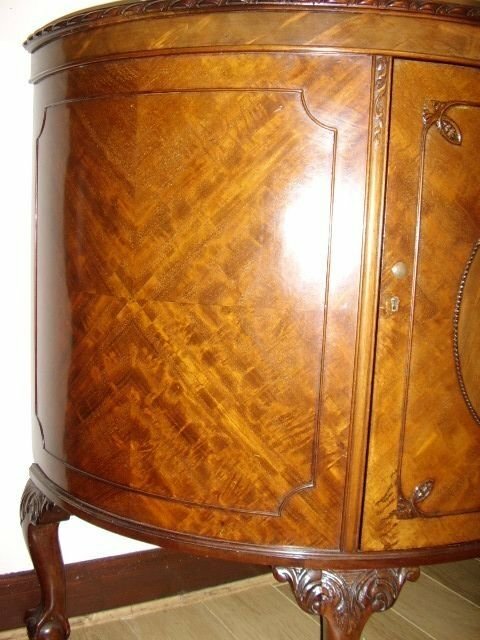 The cabinet has round ball feet to the front. Quality large scale polished rosewood William IV Polescreen on three claw scrolled feet,being fully adjustable and with a hand sewn florrel tapestry panel fitted in the upper shield under glass. 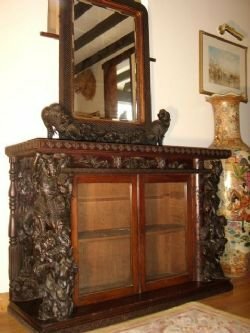 Chinese carved rosewood sideboard with quality beval cut mirrored back and finished with superb decorative heavy carvings of Samuri Warriers and Shee Shee Lions,all supported by flowers & forna. 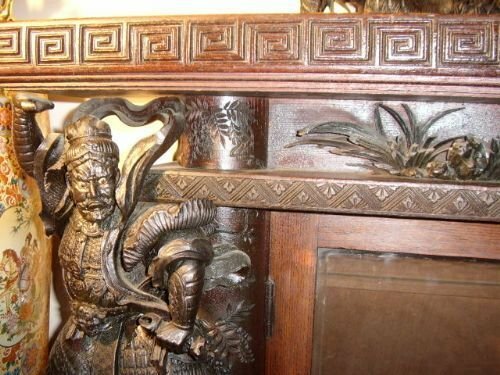 There is also an additional section of carvings on the back corner pillar areas,which include a large bird flying outstretched being held in the air by a carved monkey,along with more florrel decoration. 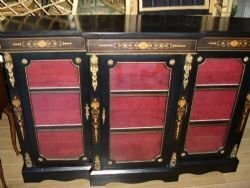 The double base unit is still glazed with the original hand made glass panels and retails the lock and wooden half shelf inside. 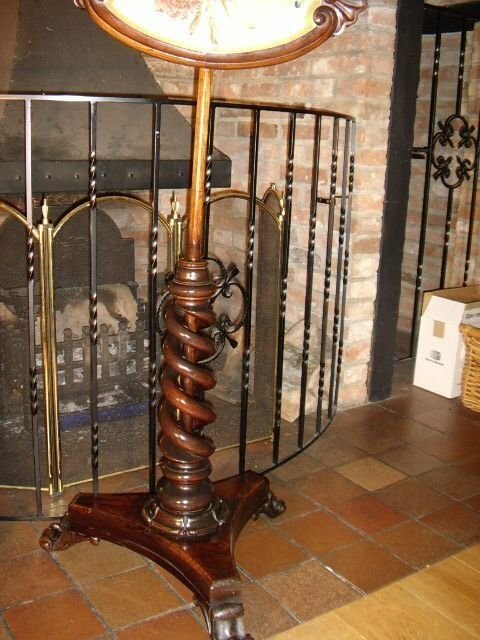 Carefully cleaned and rewaxed to reveal a rich dark brown rosewood with beautiful patina. 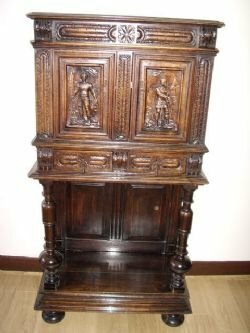 The overall condition is very good throughtout,althought there are afew losses with the fine detailed carved areas,which are not too obvious. 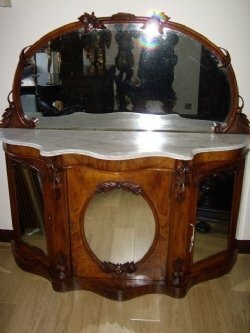 There should also be a piece of decoratively carved wood positioned either side of the bottom corners of the mirror. 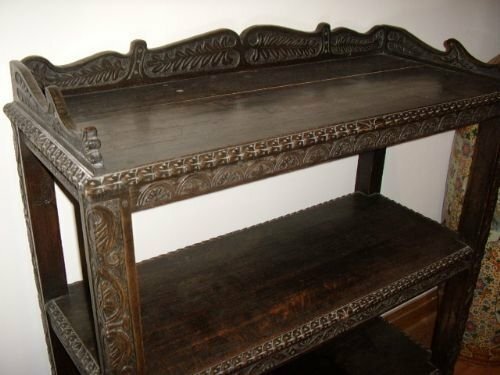 A very heavy and solid piece of well made hand crafted furniture,superbly enhanced by the attached top quality large scale carvings. 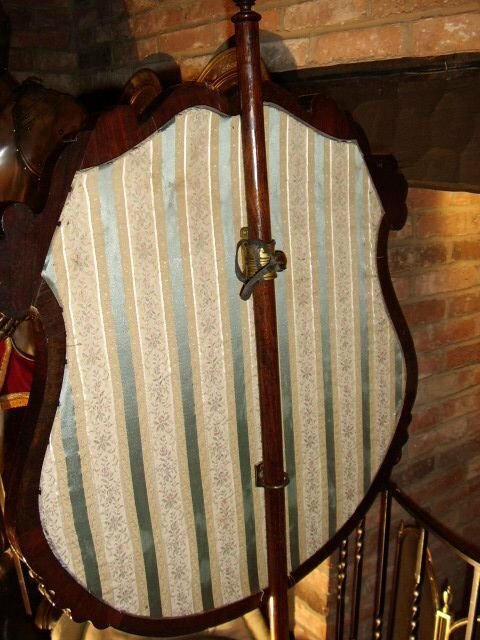 The upper mirror is easily removable,sitting securely on the two main frame uprights,which lower themselves into two large peg holes. 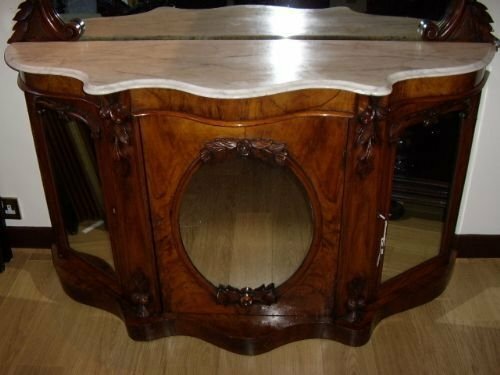 Please Enquire for more details on this ldeceptively arge scale quality built piece of furniture,thought to be a special imperial palace piece. 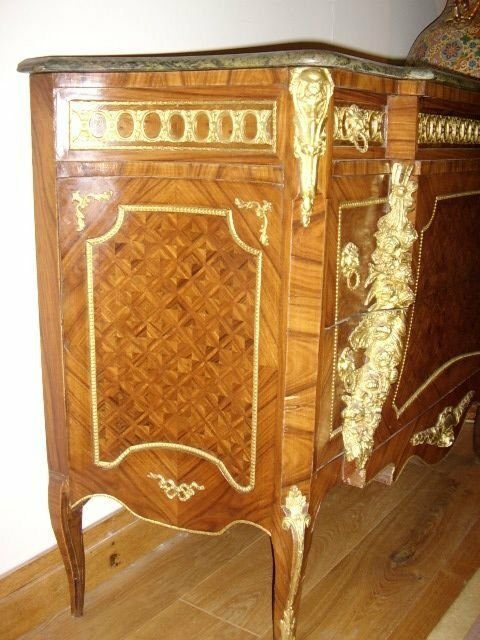 A STUNNING LOUIS IV STYLE CHEST OF DRAWERS WITH ORMOLU MOUNTS. 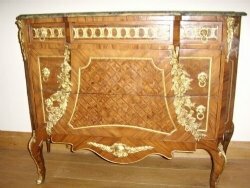 The Chest is beautifully veneered with a chequered parquet pattern and has a main central upper drawer with a pair of tiny drawers either side. 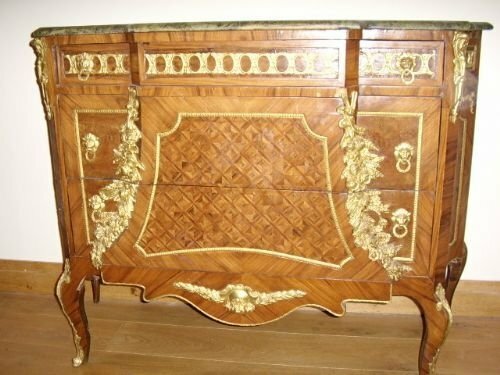 The Chest is decorated with numerous ormolu mounts and has two large double drawers to the front. 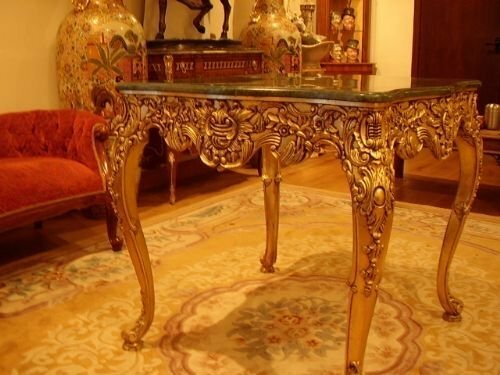 The top is finished in a green patterned marble with beval cut and polished edges. 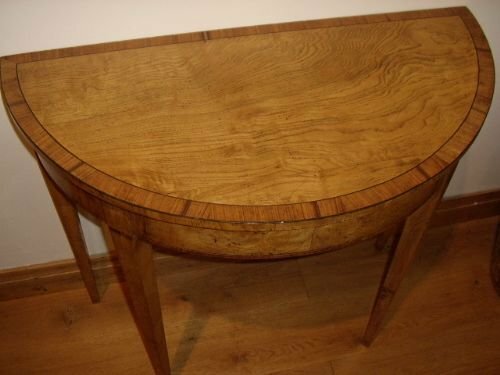 The item is a quality hand crafted example. Would look nice with a gilt mirror as backing behind. The cabinet is manufactured from ebonised mahogany and has a cental opening door with half shelf inside. 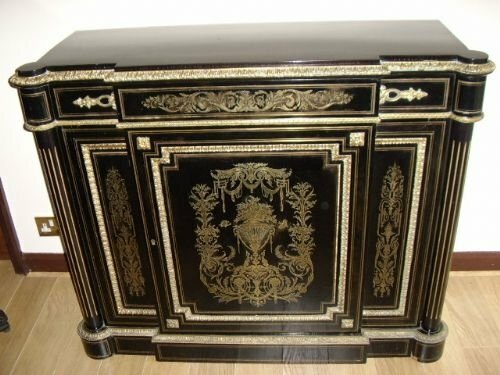 The front edge of the internal shelf is polished black and brass inlaid.The remainder of the interior is beautifully finished in french polished mahogany. 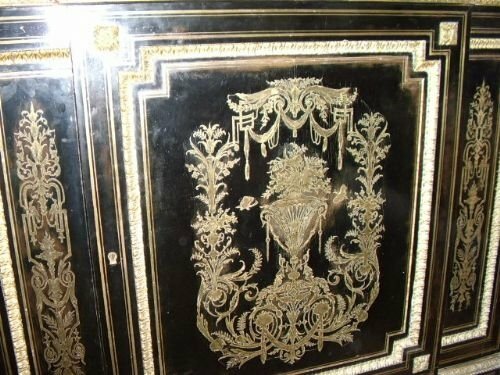 Ther are ormolu brass gilt mounts around the contours with plentiful fine brass inlain designs of flowers throughout the entire frontal panels. 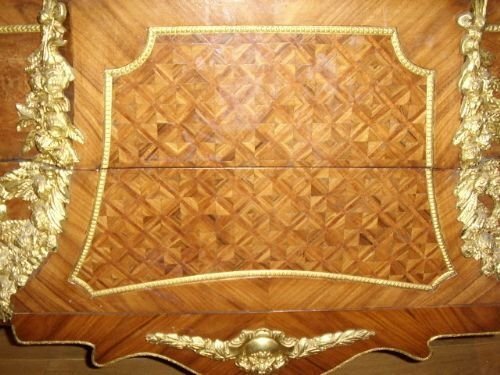 There is fine inlaid straight trim to the end panels. 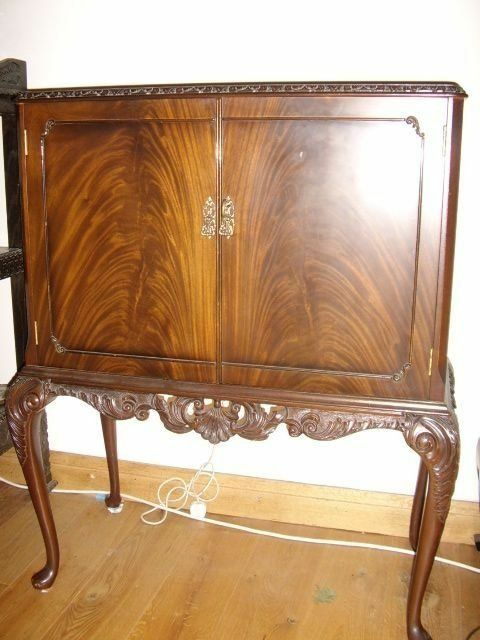 The condition is very good indeed in consideration of the overall age of this superb credenza. 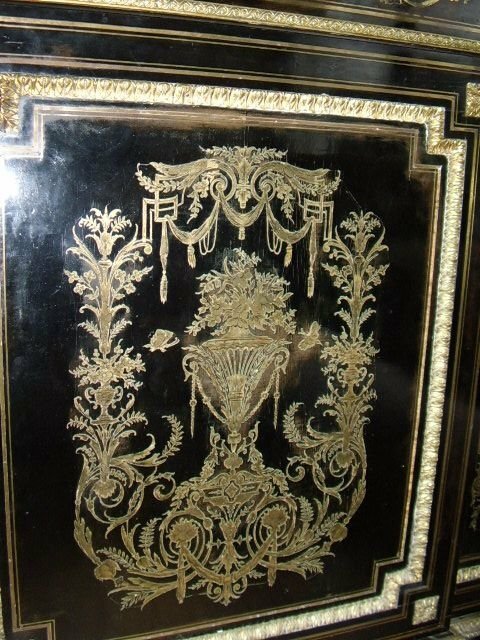 The polished finish of the inlaind brass decoration stands out beautifully against the black panelwork. 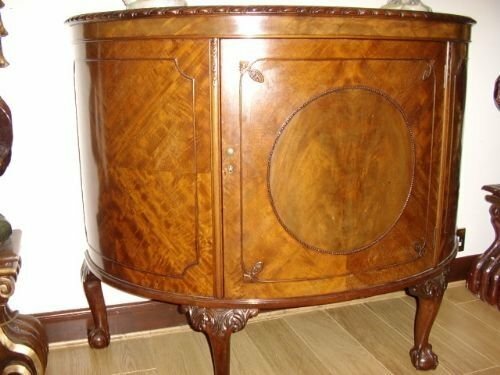 Today there are few example like this on the market and its sensible shape and size make it popular for furnishing any victoian home. 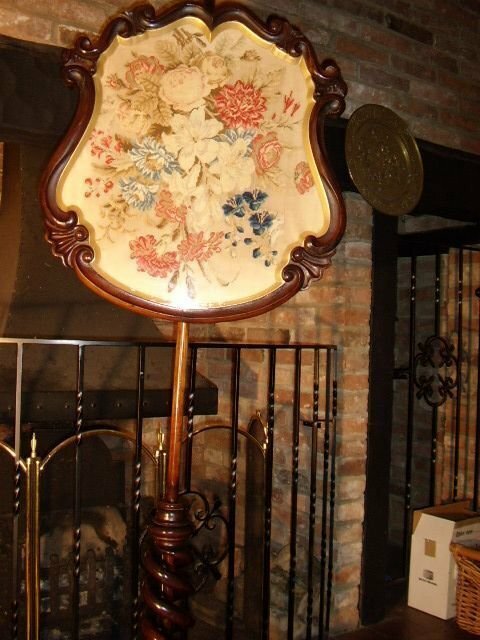 Measurements are Width 50 Inches x 41 Inches in Height.The unit is 17 3/4 Inches in Depth. 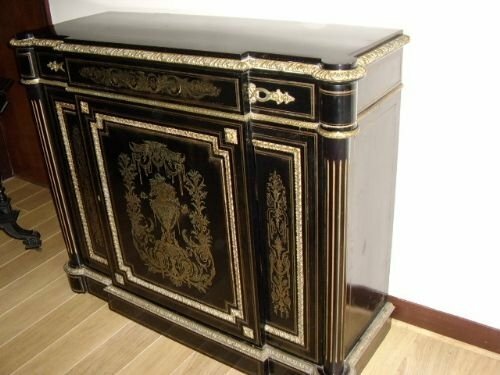 A SPECIAL CREDENZA OF RARITY/PLEASE DO NOT DELAY IN ENQUIRING ON THIS PIECE. 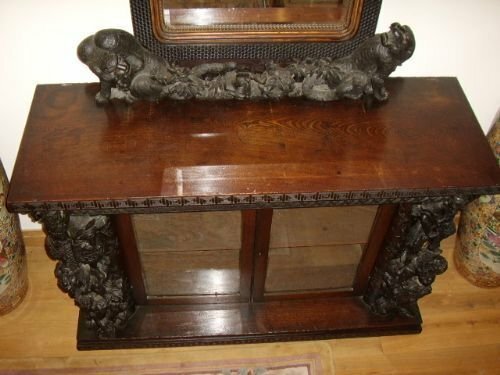 EARLY VICTORIAN SERPENTINE SHAPED CREDENZA IN FIGURED WALNUT WITH MIRROR BACK AND DECORATED WITH CARVED ACORNS & LEAVES C1837-50. 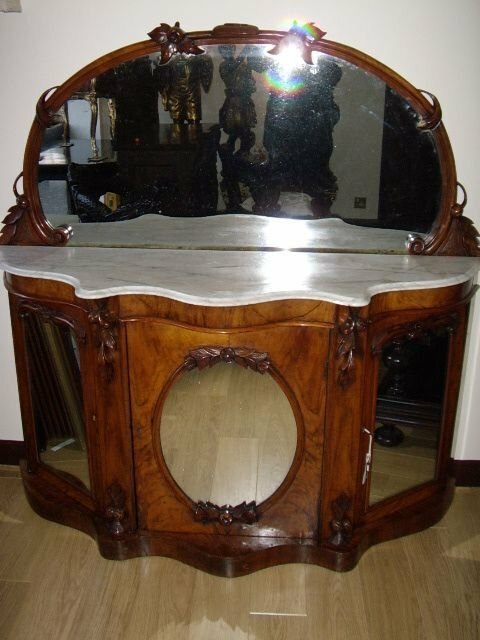 A BEAUTIFUL EXAMPLE OF A FIGURED WALNUT MIRRORED SERPENTINE SHAPED CEDENZA BEING DECORATED WITH CARVED ACORNS & LEAVES,WITH BEVAL CUT MARBLE TOP PLINTH C1837-1850. 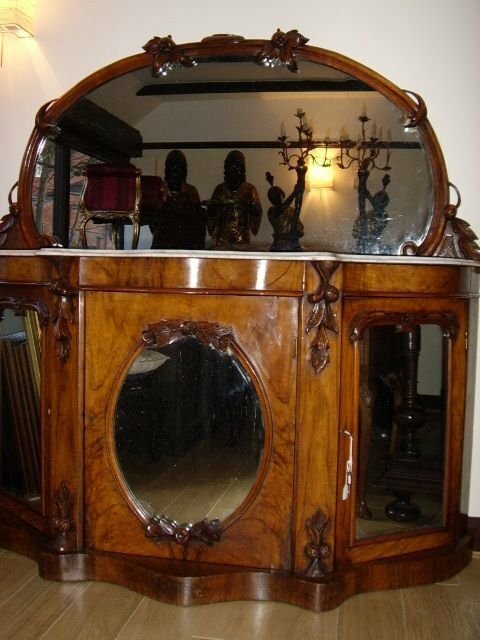 This is a rare chance to acquire a credenza which still has the ornate mirror back attached. 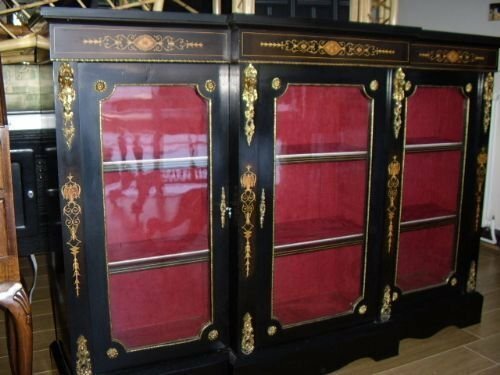 A rich colour with ample storage and having all original glass mirrors intact in good order fitted to all three opening door panels,surrounded by a round beaded trim with carved acorns and leaves. 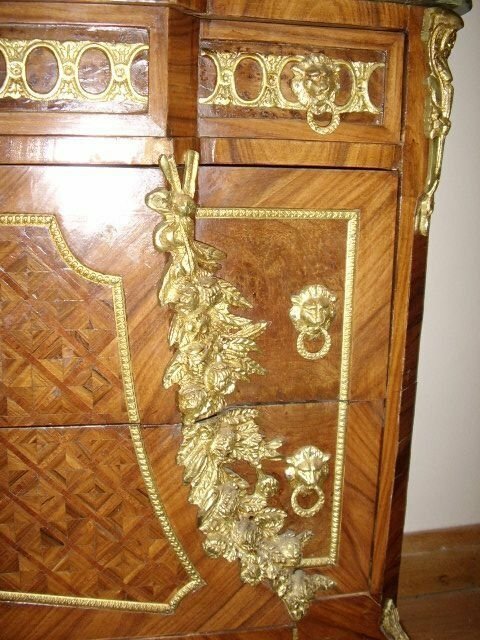 There are two keys available and locks are working. 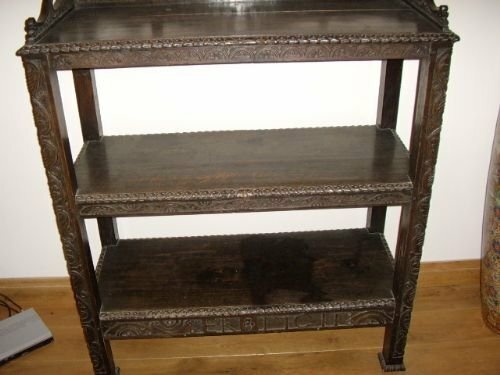 Plenty of internal storage and three split shelving levels,all being removable if required. 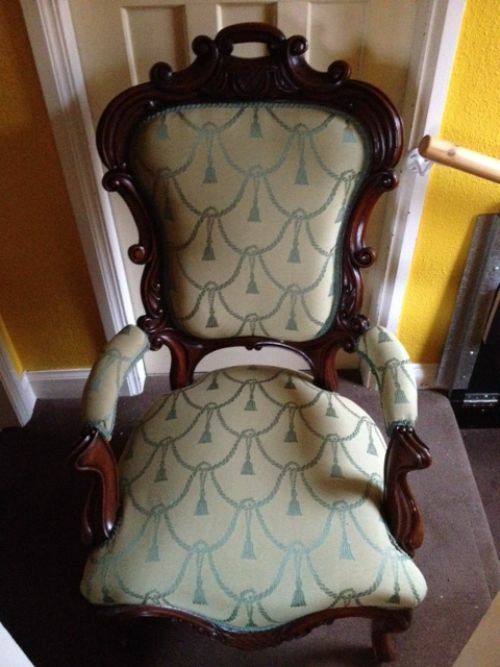 Condition overall is very good considering the age. 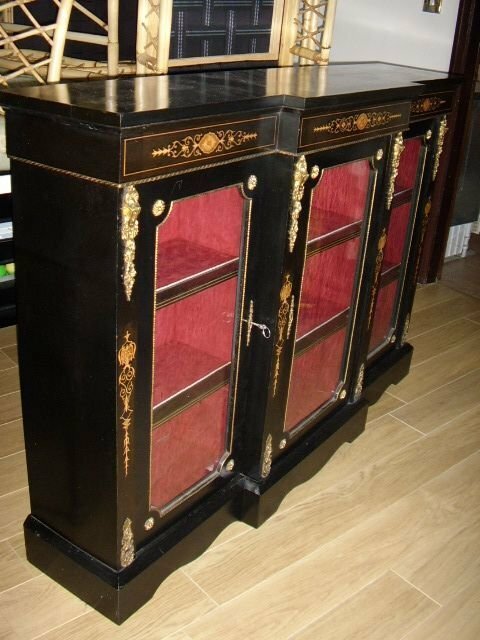 HEIGHT To Include Back 5 ft.
A substantial Victorian ebonised inlaid credenza display cabinet with three separate compartments serviced by separate glass doors all of which are lockable. 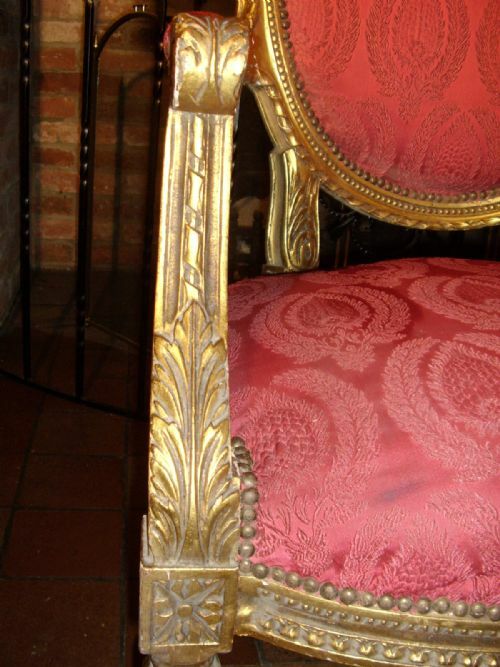 The upper front rail is elaborately inlaid with satin & tulip wood decoration and is dressed in ormolu gilt mounts being displayed down the front pillars. 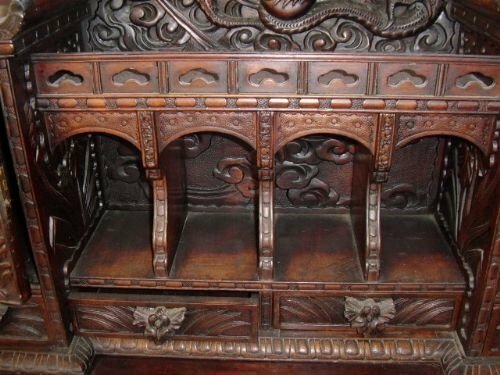 There are further inlaid areas to the front pillars. 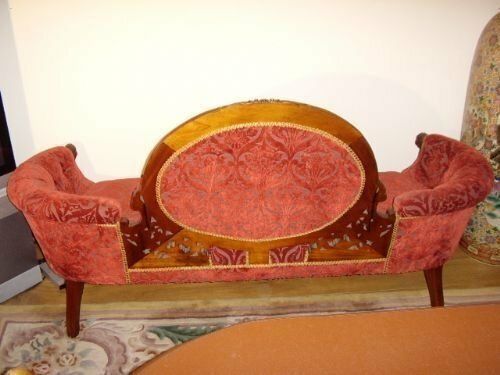 Finished in an ebonised veneer and having been refurbished inside with a plush soft pale red velvet. 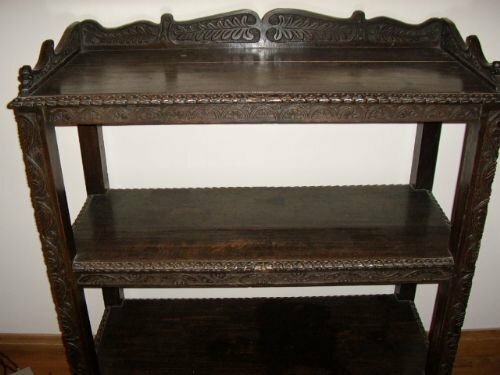 The shelves are all removable and have their front edges trimed in a satin rope beading. The top surface is in a good clean condition as is the overall cabinet inside & out. Ideal for displaying all your silver or porcelain. The Depth is 12 Inches at either end and is a little deeper in the middle being 14 Inches. 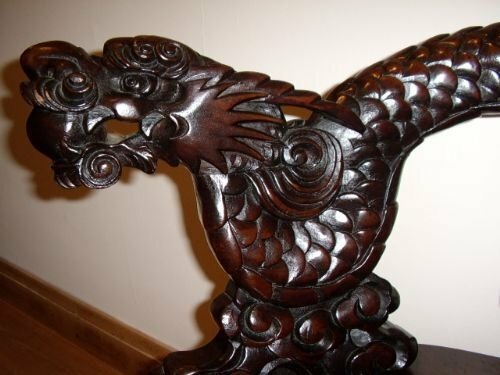 CARVED ROSEWOOD CHINESE DRAGON DESK C1900. 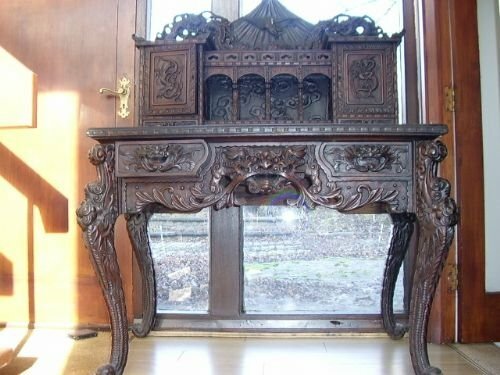 A stunning carved oriental desk ornately decorated with dragon designs on most of the panels with all four legs modelled on a chinese dragon upsidedown. With two main front drawers and four tiny ones in the galleried upper tier,along with a pair of small lockable cabinets. The carved back panel has a bird carved in the middle and there is a face carved in between the two front lower drawers. 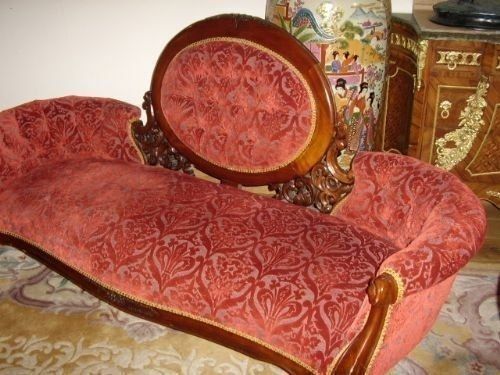 This item is full of interesting aspects telling their story,and has a redish brown patina. 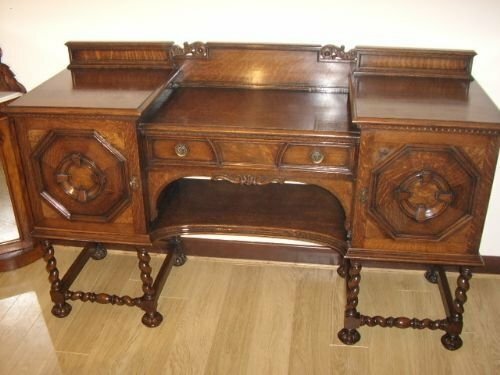 The desk is in need of a full rewaxing and will look fabulous once completed. 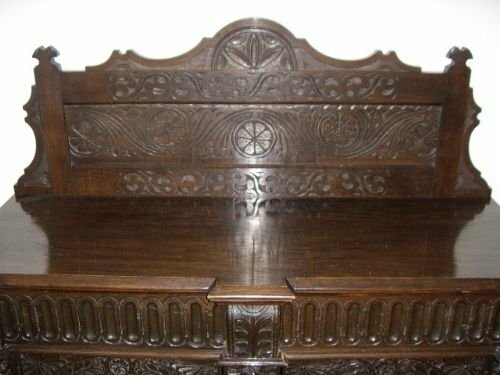 We intend to fully rewax and restore the finish,but thought it would be sensible to show that it is very old before cleaning. 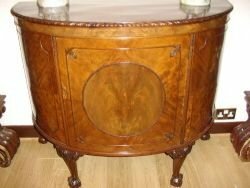 www.MansionHouseAntiques.co.uk to see what rewaxing can achieve,a fabulous finish & patina. 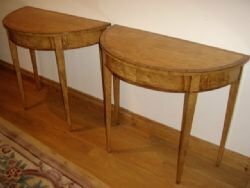 Measurements are Width 4ft. 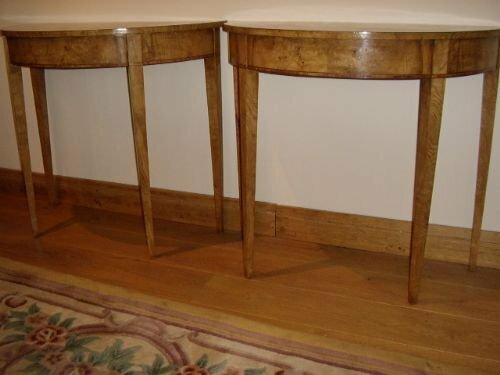 x Depth 2ft.6"
A wonderful matching pair of regencey design demi-lune console side tables,beautifully made from a variety of wood veneers and displaying a fabulous grain and natural original rich collour. 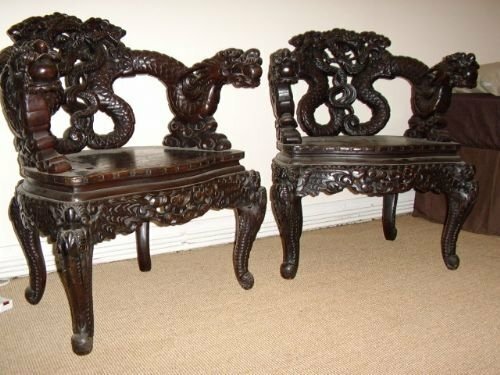 They have been hand crafted using fine cuts of both burr-walnut veneers to the frontal facia and walnut on the upper surfaces,with a one inch mahogany bordering the circumference around the top surfaces ,being finely edged in a dark ebony stringing with cherrywood inlay to the lower font curved edge. 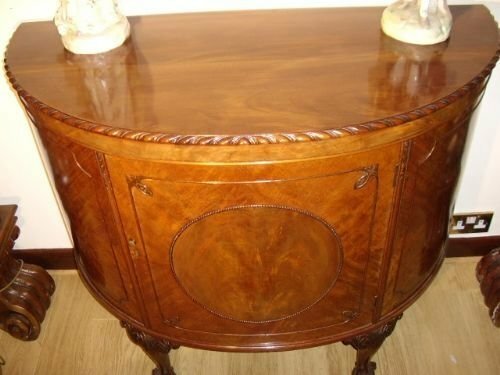 Well wax finished with a good surface patina and original satin and honey glazed colouring,with no signs of fading and without any bad marks on the top surfaces. 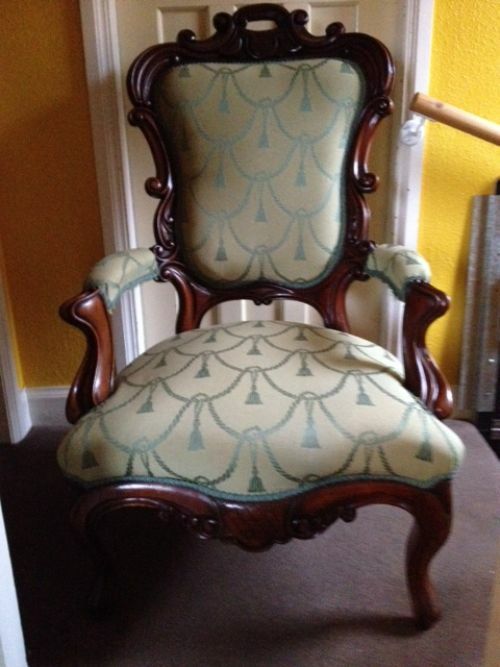 These lovely examples are believed to date between 1830-50. 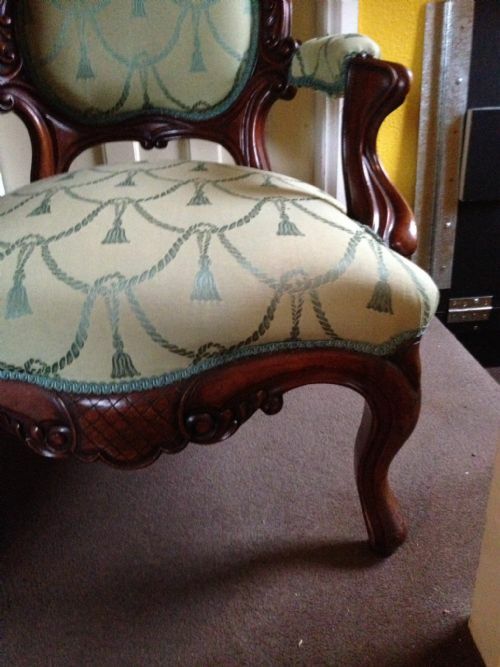 Condition overall is very good and original throughout considering the age. A fine pair of mahogany carved armchairs,depicting a pair of chinese dragon with their coiled scaled tails forming the decorative back rail. 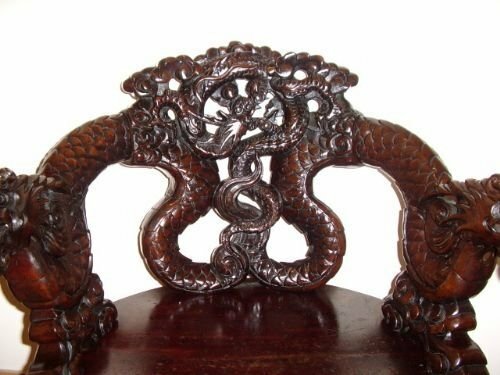 The carved Dragons heads form the chairs arms with mouths open. These examples are top quality. 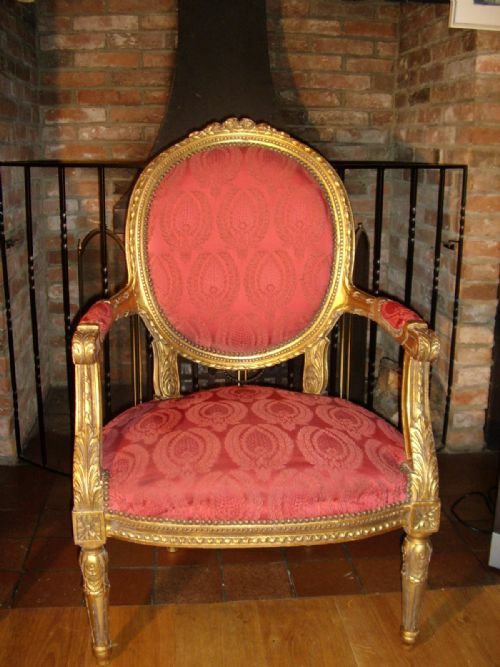 THIS EXAMPLE HAS BEEN HAND WAXED ALL OVER TO REVEAL EXTREMELY RICH BROWN PATINA THROUGHOUT. HOURS 10AM- 10PM 7 DAYS A WEEK. 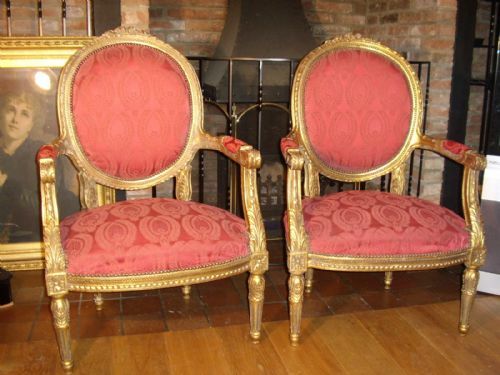 Beautiful pair of matching gilt salon or drawing room armchairs,each nicely carved with good detail,having sprung seats and still in an early material. 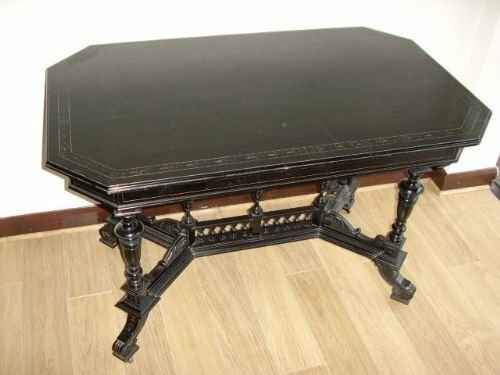 Condition is very good commensurate with age and are in acceptable state to place straight into an antique setting or room looking impressive. 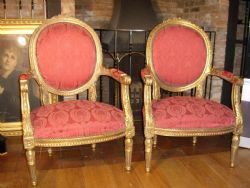 They are both had made to a good standard being very heavy and solid with a rich gilt finish. 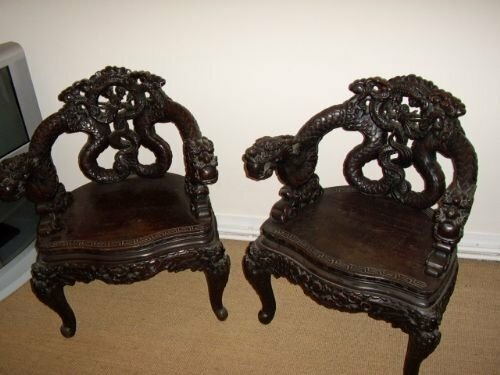 Hard to find such a good well balanced pair of quality built chairs,which will gain value over the coming years and still be in service 100 years from now if looked after as before. 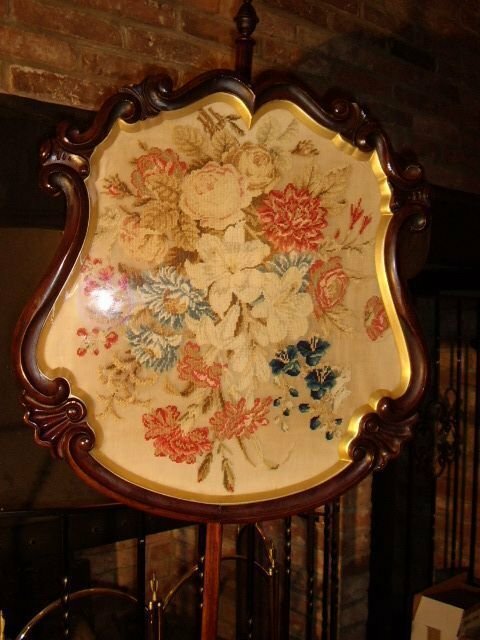 embroidered garland florrel design throughout. a bonus to still have an earlier material intact. which they do not really need. 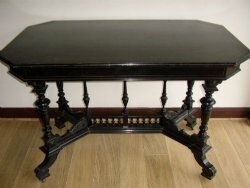 PLEASE REQUEST A QUOTE FOR DELIVERY. 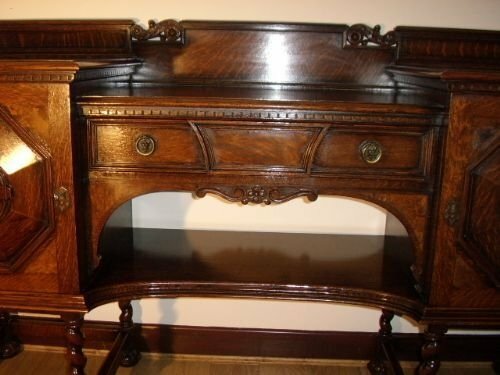 A quality hand crafted Demi - Lune mahogany sideboard,finished throughout in a rich flame mahogany veneer,sitting firmly on carved ball & claw feet. 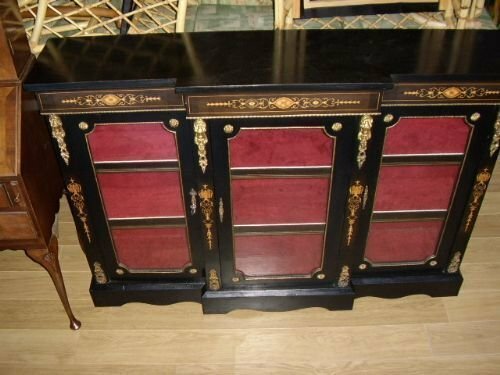 There are three opening cupboards with a half shelf divide inside. 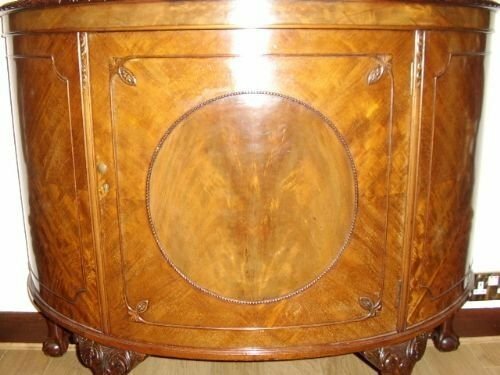 The upper surface is well polished with no marks affecting the appearance. 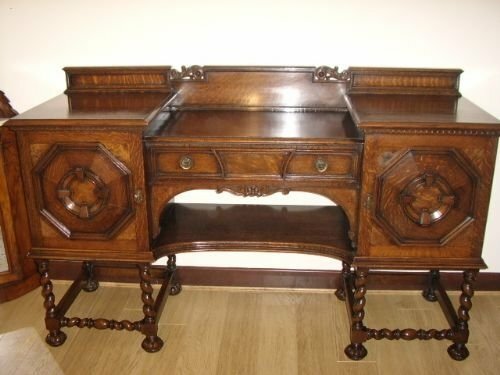 A wonderful example of a beautifully made solid oak and burr walnut inlaid sideboard by the famous furniture manufacturer "Waring & Gillows" of London. 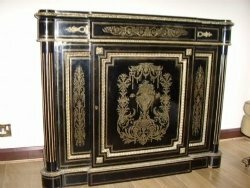 This particular sideboard was produced in their Liverpool factory and was supplied new especially for the Russian Embassey in London back in 1910. 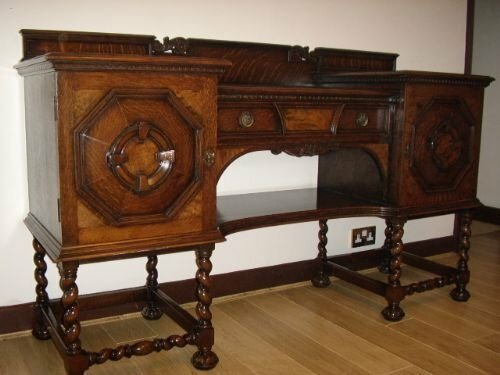 The oak has been hand crafted with veneers of burr walnut laid onto the front doors to enhance the finished appearance. 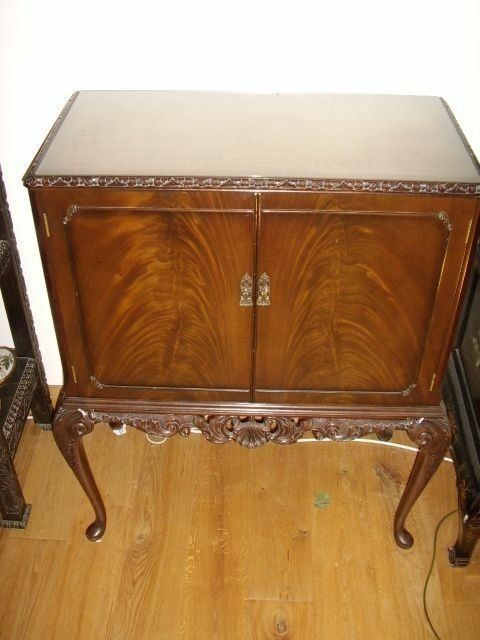 The build quality is heavy and substantial with the sideboard having a rich medium well glazed finish. 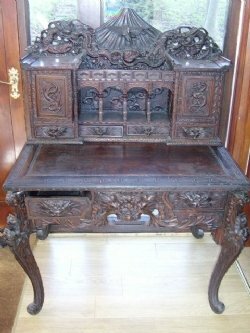 The condition is very good generally considering this piece of furniture is 100 years of age,and still has both keys. All nicely polished without any marks evident on the top surfaces. 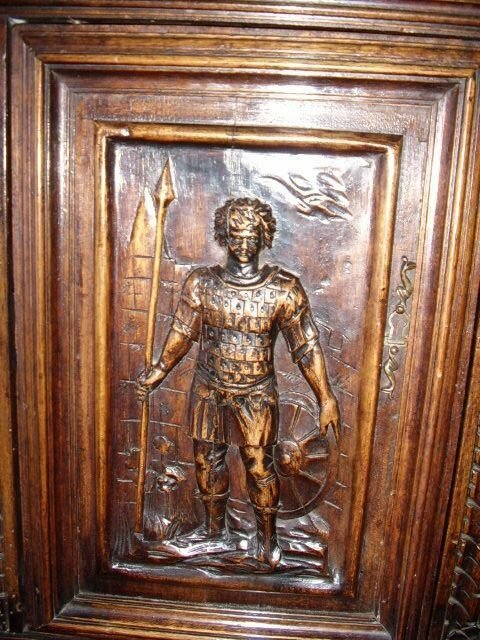 on the inside of the left hand cupboard door,inside which there is a cuttlery internal green felted top drawer. 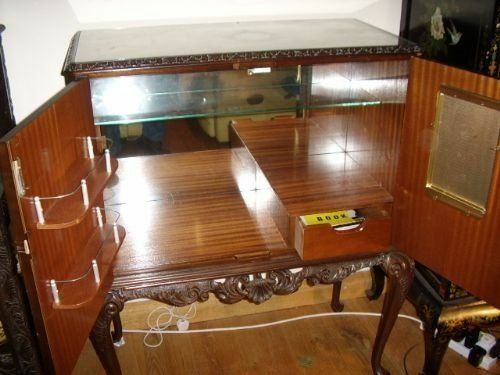 The left hand cupboard has an open internal drawer which removes. 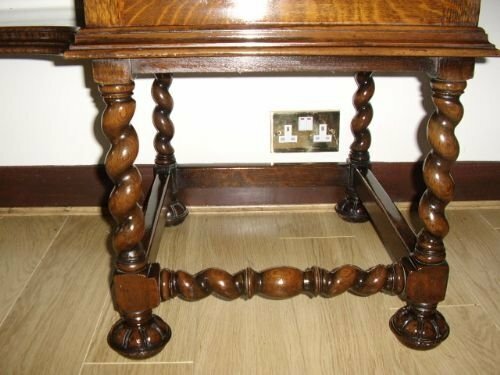 The supporting framework is of hand crafted barlytwist design with eight carved bun feet. HOURS 10AM - 10 PM 7 DAYS A WEEK. 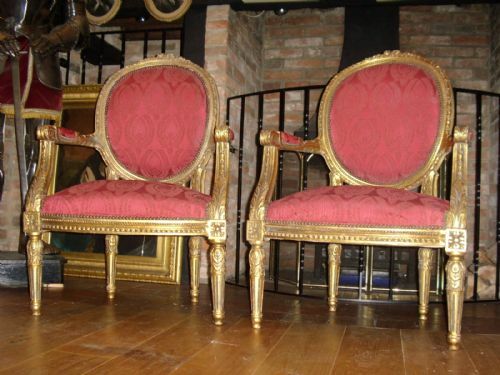 DELIVERY EXTRA FOR UK MAINLAND ONLY. The table is on regency legs,which may well date this piece to between 1830-37,with tiny castors. 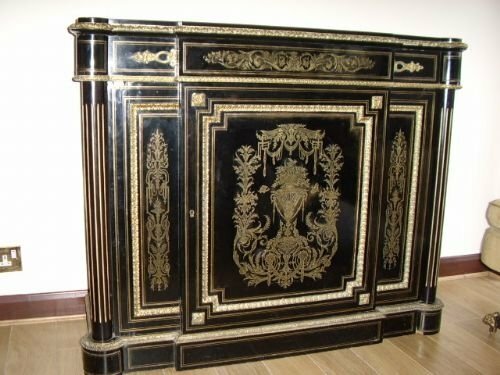 The Measurements are Width 47 Inches x 24 Inches in Depth.The Height is 31 Inches. 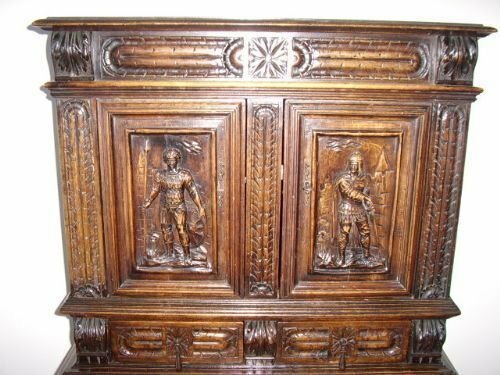 A very decorative carved oak Jacobean style Sideboard finished with three figures to front pillars. 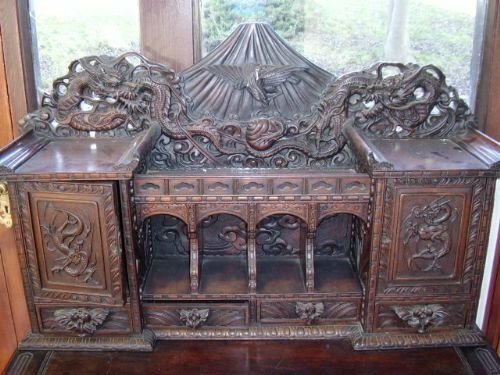 The back section also ornately carved with a pair of opening drawers to the front and having an half shelf division inside. An heavily carved Jacobean influenced piece of furniture being extremely useful for storage. 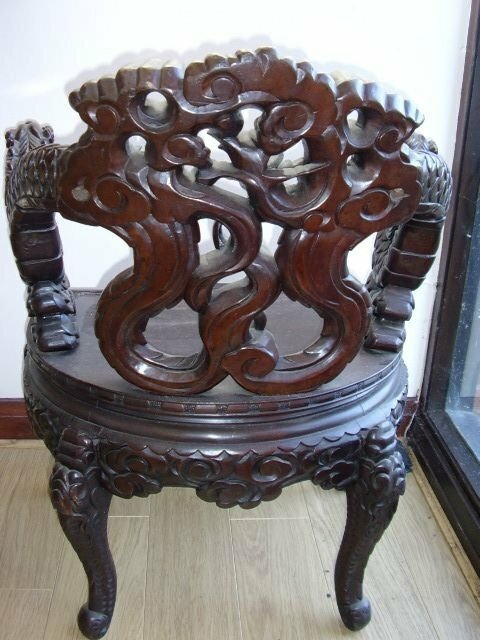 The Height is 36 Inches and 53 Inches Inc. Back.